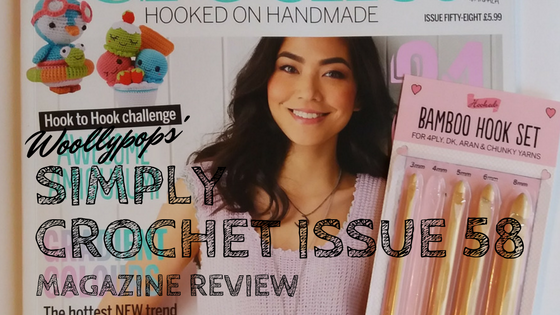 Hello All And welcome to this sneaky peek (for those of you yet to get this issue) and review of Simply Crochet issue 58. So lets get stuck in to the nitty gritty. Here is this months gorgeous and fresh front cover, and free gift! This month the magazine comes with 5 yes 5 free bamboo crochet hooks. This months mag is worth it for the freebie alone I mean where can you buy a set of 5 decent bamboo hooks ranging from 3mm to 8mm for under £5.99??? Couldn't you just eat this!!?? 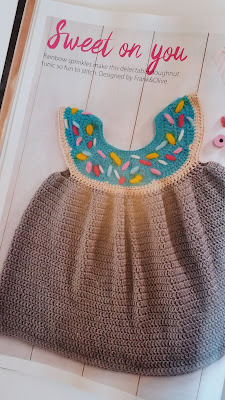 This is a super cute doughnut tunic designed by the fabulous Frank and Olive. This pattern looks soooo adorable, I love the contrast of the colour against the grey and its marked as easy peasy on the pattern! 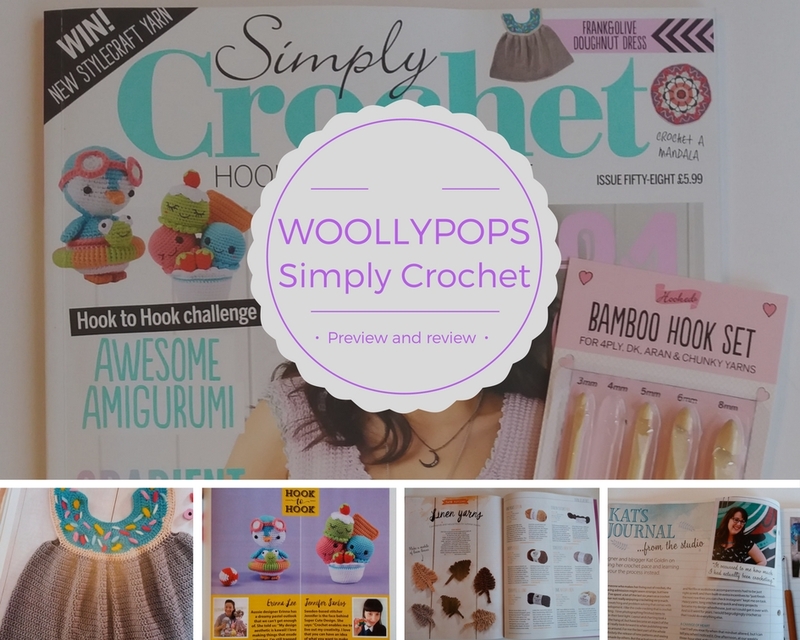 So for all you beginners out there you've got your free hooks and pattern all you need is your yarn! Simply crochet have also added a nifty 'Save or Splurge' box to the pattern which tells you where you can buy a cheaper alternative yarn! Now that's my kind of pattern. Next one of my favourite parts of the mag, the journal from a designer and maker. This month is Kats Journal. 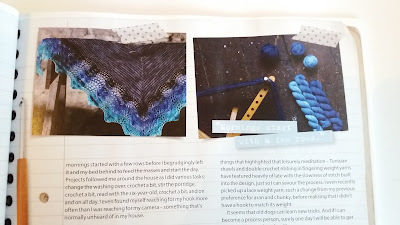 Kat Goldin makes her living out of crochet, and I love the insight she brings into everything she writes about. Here super gorgeous (no exaggeration here its simply divine!) website slugs on the refrigerator can be found here. 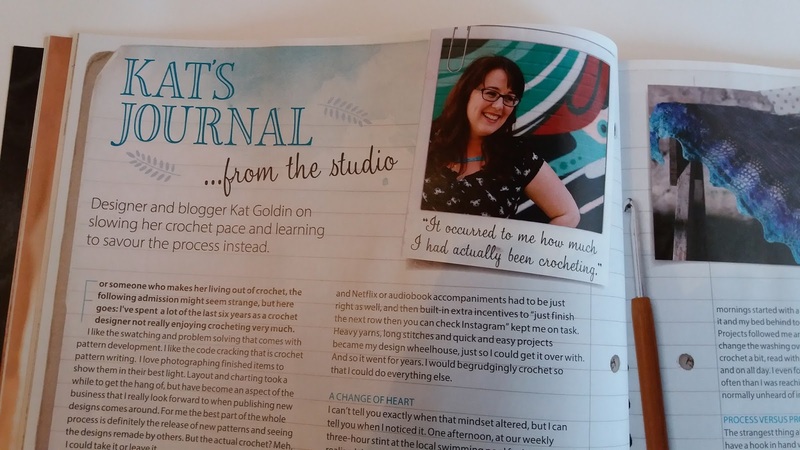 This month Kat comments on how her business and livelihood are based of a skill that she doesn't necessarily practice everyday and how its important to genuinely enjoy what you do. The colours in Kats pictures are simply devine and remind me of the beazch or a deep sea lagoon. she's a very skilled woman and an inspiration to me. I love her notions and insight and not only is she a very skilled crocheter but also a great writer too, I have to say she's a very inspiring woman. A fairly new section to the mag next, the Hook to Hook section. 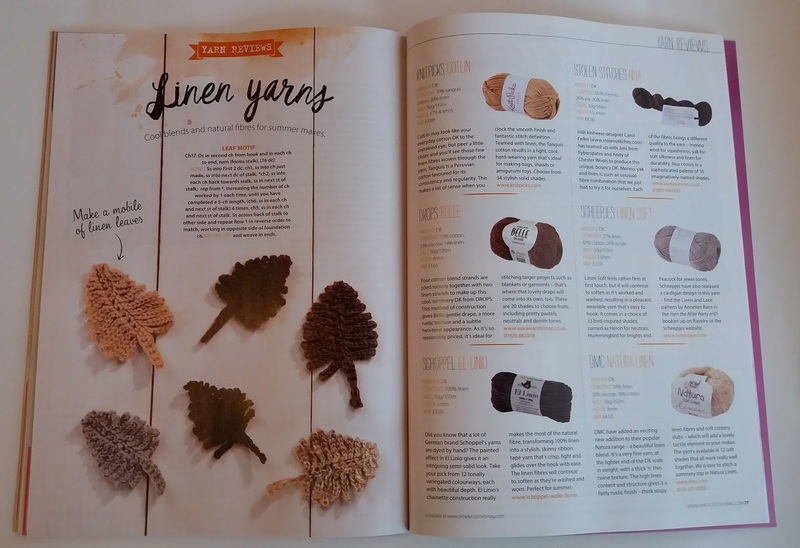 In this section a yarn is selected each month, and two fabulous designers are asked to make something from the yarn. 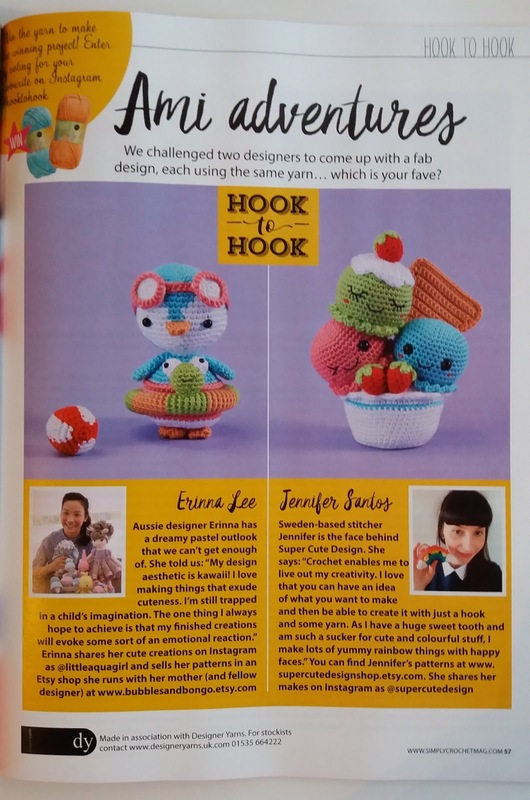 You the reader then get to vote for your favourite on Instagram, and this month its my favourite subject AMIGURUMI!!! Just look at the cuteness we are dealing with here! Super cute penguin vs. super cute ice cream, I swear it made my eyes pop when I saw this! 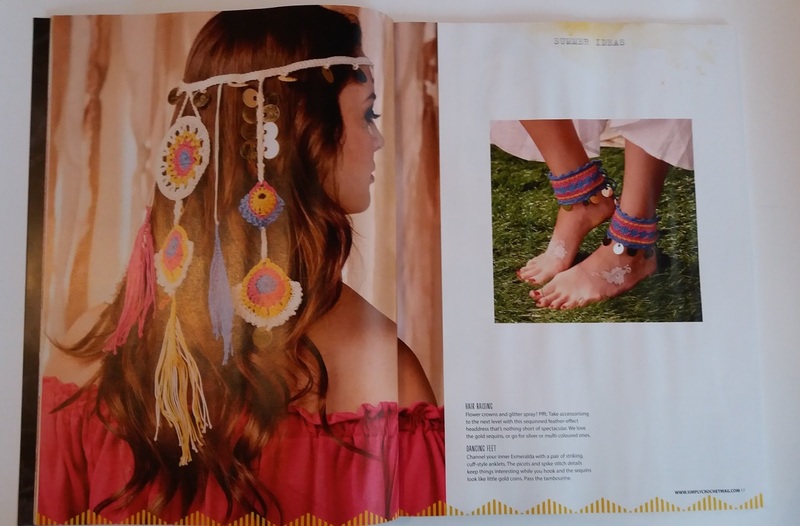 This months designers are Erinna Lee, co-owner of Bubbles and Bongos on Etsy, with stunning dolls, and animals that will make you instantly fall in love her Etsy store is well worth checking out (you can find it here). The second designer and another fantastically skilled crocheter is Jennifer Santos. 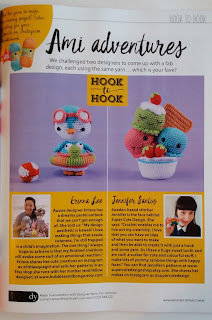 Jennifer is the face behind super cute design, and the name does not disappoint, if you have a click over to her etsy shop you'll notice the gorgeous use of colour, and how she takes simple designs and makes them so adorable (I especially love the unicorn doughnuts!). Due to the detail in these patterns I'd not recommend them for the beginner, and do note they are worked in a small hook which can be fiddly but soooo worth it :). Who doesn't love a good yarn review? Its coming up to summer time, and you're wondering, what is the best linen yarn to keep garments and accessories cool and comfortable. well this month Simply crochet have put together a guide of Linen yarns in their yarn review section. there's six yarns here to choose from in these beautiful neutral colours (I'm thinking neutral boho headband with a pop of flower power colour! ), and a leaf motif pattern made in all natural fibres, from the yarns reviewed so you can see how they work up into a finished product. The price range on these is also great, as you'll guess I'm a bit frugal when it comes to all aspects of life, so I love the fact I can buy a skein of yarn with natural fibres for as little as £1.65. So I come to my last little tid bit for you to peruse, the mandala at the back section. 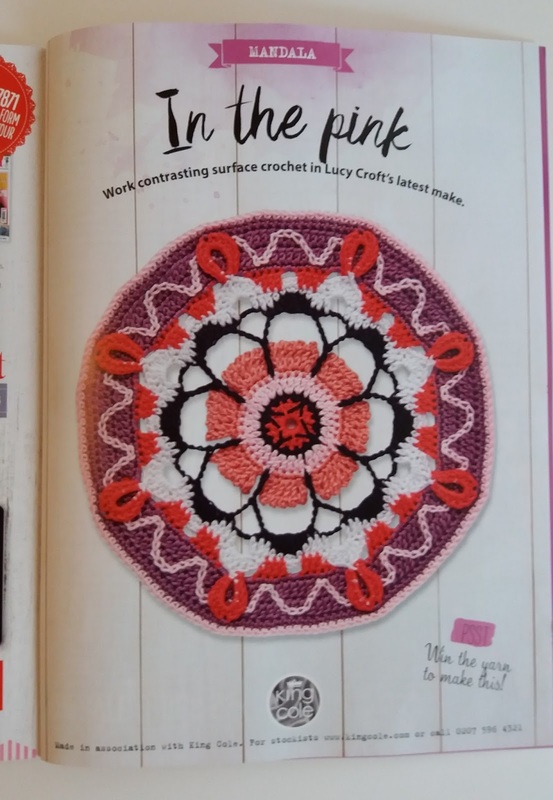 Each month Simply Crochet publishes a mandala at the back of the magazine, and each month they delight with pops and splashes of colour and gorgeous intricate design. This month does not disappoint. Designed by the lovely Lucy Croft who's a regular designer and featured often in the magazine (you can find her Ravelry page here). Hooked in delectable King Cole cotton yarn and is marked as easy peasy according to the mags rating system. You can also find more mandalas if you order back issues of the magazine, as they launched this selection in the new year to match their calendar for 2017. 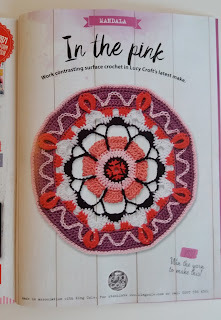 So there you have it, your sneak peek of Simply Crochet issue 58. Now I did promise that I would root out the best subscription deals for you, so here we go. I currently subscribe via Immediate Media. They have a great deal at the moment, you can buy 3 issues for £5, that's 3 issues for the price of not even one (each issue is £5.99 in shops). They also have a fantastic offer on a 12 month subscription, 13 issues for £53.49, that's mega savings of £24.38!!! That's 13 issues for the price of 9 and only £4.11 per issue! You can find that deal here. After a thorough look around this is the cheapest deal out there, and I can honestly say it is a bargain. 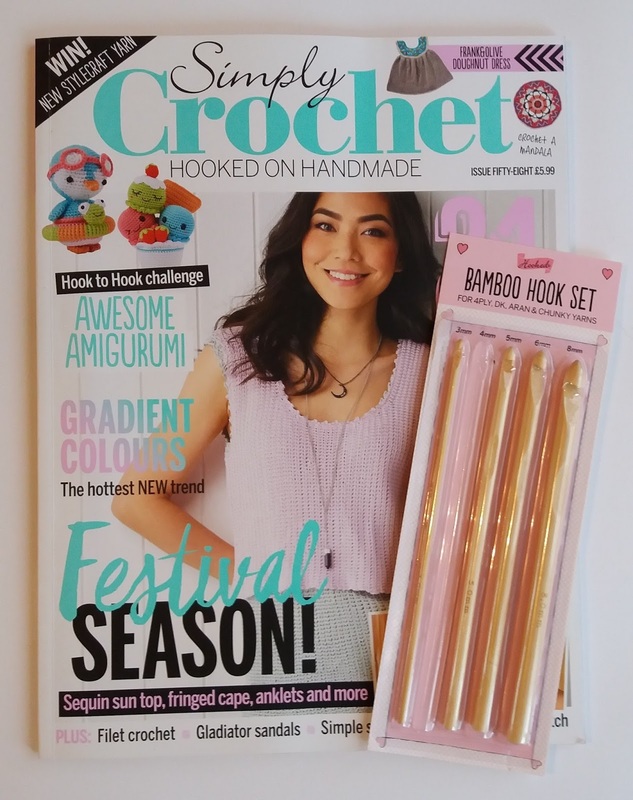 Its well worth a subscription for those of you that love crochet, and equally those of you that want to begin, or learn a new skill, I urge you to go go go!